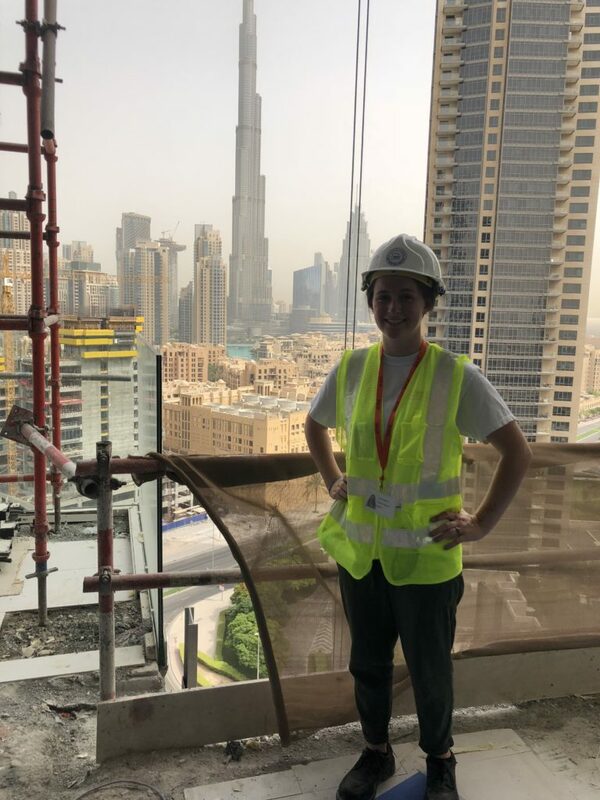 Last summer, Haley Bigando set off for what would be a “life-changing” experience, studying abroad in Dubai as part of the Dubai Contracting Company Internship Program. While collaborating with students and professionals from around the globe, she prepared for her own future in engineering. You said that your experiences in Dubai were “life-changing.” What was most memorable part of the trip? I’ve never been abroad before, so studying in another country and learning about another culture was a huge change. One day they picked us up in SUVs and we drove into the desert. It felt like a large-scale skate park when we drove up the dunes and dropped back down. We stopped at sunset, and drove down to base camp for dinner. Some of us rode camels and went sand boarding, which is basically snowboarding, but in the sand! It sounds like you formed some close relationships while you were in Dubai. What was it like to study with students from another country? 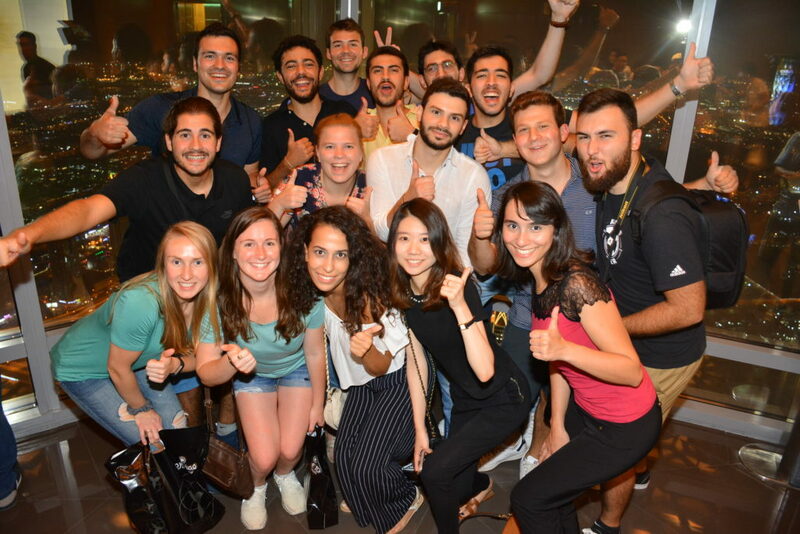 Half of the students in the program were from the Lebanese American University. We got along with them so well; we lived together, shared our experiences, and showed each other pictures of our hometowns. We had lunch together every day in the office and it would always be something different; some of it we didn’t like, some of it we loved! It was also fun when they would teach us different phrases in Arabic. How did you connect with executives and other engineers at the Dubai Contracting Company? When we arrived, each department head explained what their department does. 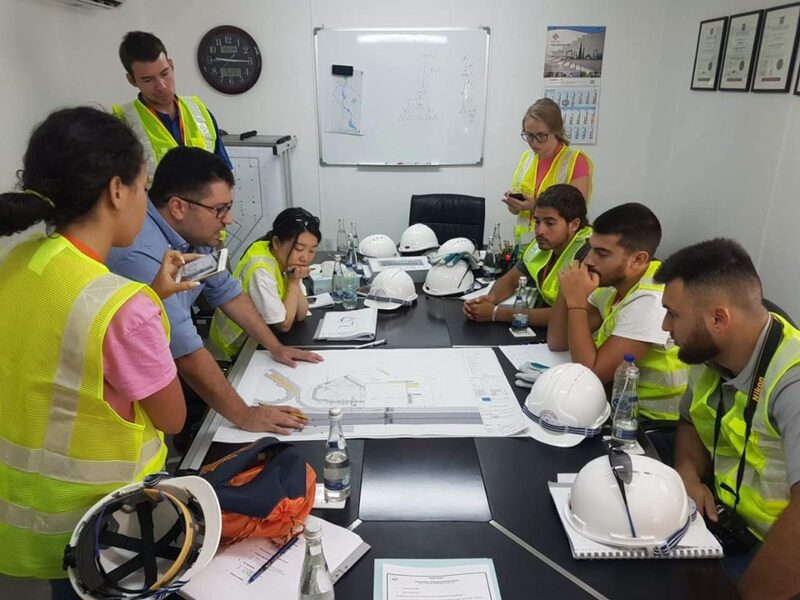 For example, we toured the planning department and then had a lecture on planning, scheduling, and how that relates to the rest of the project. We even gave presentations to the CEO, Mr. Yabroudi (’78, G’79) and he critiqued us. He pushed us to work very hard, because we jam-packed everything into four weeks. 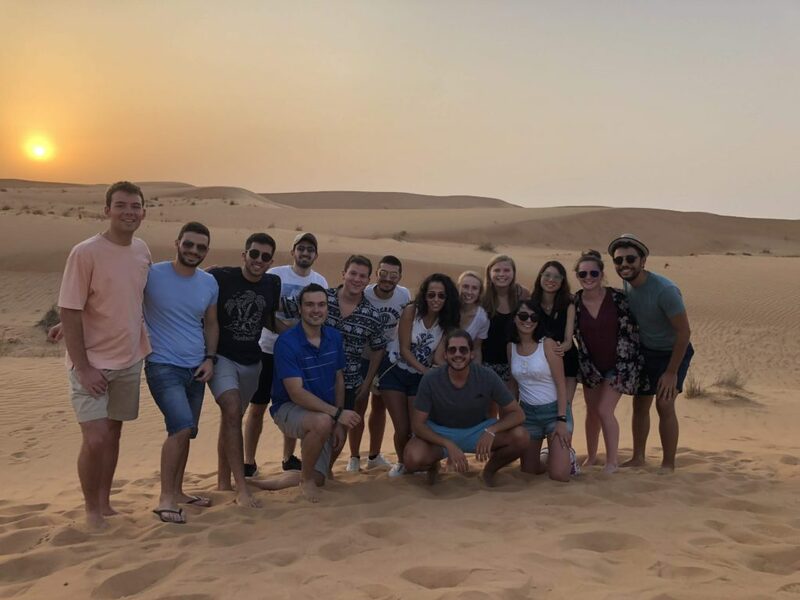 How did studying in Dubai change the way you look at engineering? We went on site tours around Dubai almost every other day. We started with sites where construction had just begun, and by the end of the program we were touring completely finished buildings. We were taught to pay close attention to detail and quality; now I pick up on things all the time that I never would have noticed before. Even if it’s just a sidewalk, or something that could have been designed better, I’ll notice it! I will continue at Syracuse with my master’s degree, because I love the close-knit community here and want to get more experience in structural engineering. After graduate school, I look forward to working for The Chazen Companies as a project engineer. What advice do you have for high school students who might be intimidated by the idea of studying abroad? When I was preparing to apply for the study abroad program, I questioned whether to go through with it, because I’d never been abroad before. But the Dubai program is short-tem, I knew everyone going, and a professor went with us. All of that made it easier. I’m so glad I handed in my application because I will never have the chance to do something like the Dubai program again. Now I’m not afraid to travel – I want to travel more! One of the most rewarding parts about Syracuse University is meeting incredible alumni that were once in the exact same position you are. I’ve had the opportunity to connect with SU alums from all walks of life. From executives at multi-national corporations to entrepreneurs starting businesses from their parent’s houses. I’ve come to notice they all share a similar trait: an immense passion for Syracuse University. 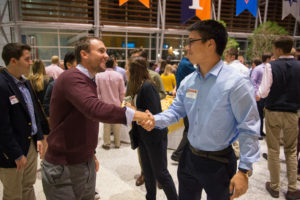 As a student, you can take advantage of that passion by reaching out to alumni. Here’s a secret: SU alumni love talking to SU students. You can meet alumni everywhere. During homecoming weekend tons of alumni come back to campus for events. You can also reach out to alumni through LinkedIn, an online professional network. Alumni will also come back to campus throughout the year for recruiting and other events. The absolute worst thing you can do when trying to build a real relationships with someone is to reach out to them for the first time and ask for something. It indicates that you’re only interested in what they can do for you. The best way to start a relationship with an alumni is to reach out and ask to learn more about their career. Set up a quick phone call with them to talk about what they do for a living and how they got there. It’s easy to tell when you’re talking to someone that’s just interested in getting something from you. Before you start reaching out to people, develop a genuine interest in learning about others. What’s worse than having no network? Reaching out to a bunch of people and not following up. The best relationships are developed over time. Keep in touch with the alumni you connect with by following up with them every couple of months. Keep a spreadsheet of the people you’ve talked to and what you talked about. It will help you keep track of your professional relationships. An easy way to initiate follow-up contact with an alumni is by sharing a news article relating to what you talked about last time you spoke, or even better, a piece of SU news they would care about. This seems trivial, because how could a student possibly help an established alumni? The point of offering help is less about helping someone on the spot and more about letting the person know you want to help them if and when they need it. You would be surprised how many people could use your help once you start offering it. Relationships are supposed to be mutually beneficial. Everyone has some sort of knowledge or skill they can share with others. Figure out what that is and distribute it. 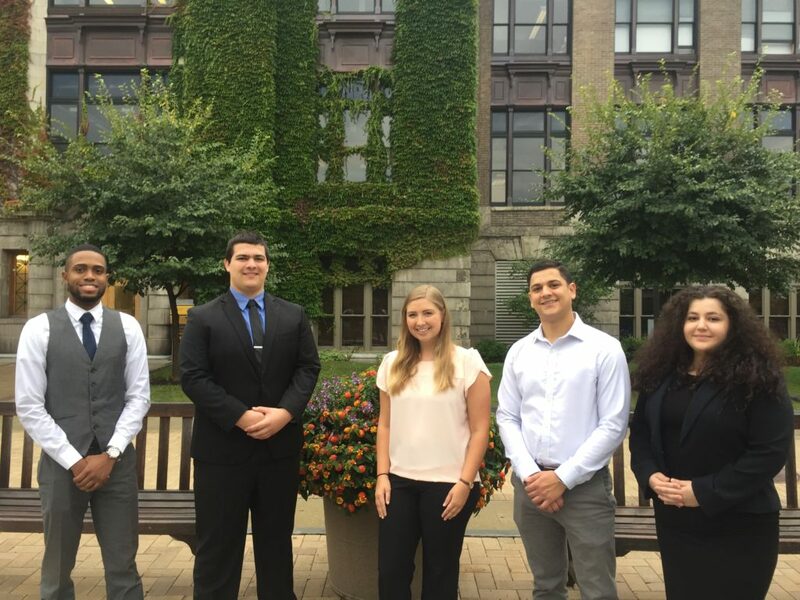 Written by Daniel Strauss ’19, a Finance major in the Whitman School of Management. Daniel is a member of the Daily Orange, the SU Investment Club, Delta Sigma Pi, and Syracuse University Enactus. How does Syracuse University prepare you to be a Math teacher? Beginning my freshman year, I’ve had field placements in schools across Syracuse. Early on it’s observational; we see how the students work, and the logistics behind the scenes. I’m getting manageable, hands-on experiences to prepare me for the student teaching I’ll do next year. It’s made me even more motivated to student teach. 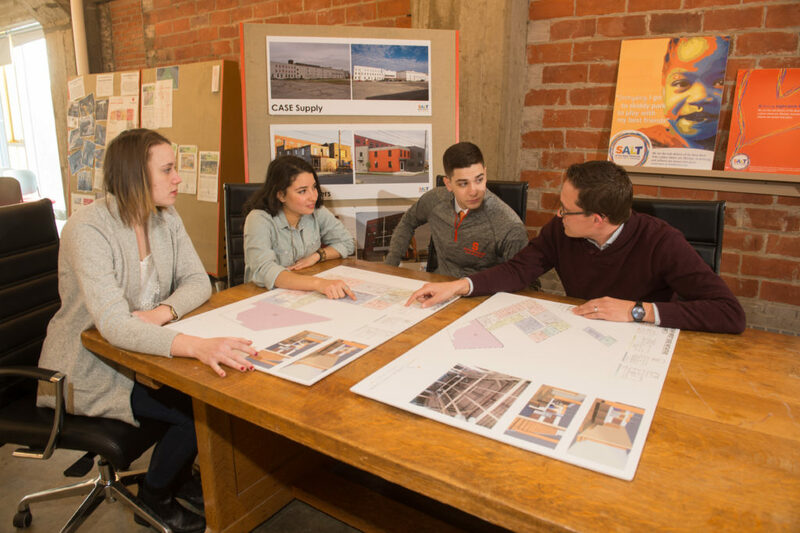 Tell me about Syracuse University’s Mary Ann Shaw Center, where you work as an intern. The Shaw Center, the University’s center for community engagement, has several unique initiatives that go out into the Syracuse City School District. There’s SU Literacy Corps, which tutors students in all areas of literacy, including Math. We also have Balancing the Books which teaches high schools about financial literacy. The Nutrition Initiative teaches students to cook recipes from around the world and increase their nutritional knowledge. Engineering Ambassadors is another initiative that provides hands-on science activities after school. What’s your involvement with SU Literacy Corps? We go into local schools and work with a couple of classrooms each week. My first semester, I worked with kindergarten through third grade students. With the second and third graders, we focused on math literacy: doing math facts, flash cards, or similar activities. How has SU Literacy Corps impacted your Education classes? Working with SU Literacy Corps has helped my confidence in the classroom during field placements, and given me relevant examples to talk about during class discussions. Why should students consider volunteer work, such as the initiatives through the Shaw Center? It’s a chance to get out into the community and be a role model for students. Why should prospective students consider the School of Education? The Education community is like a little family, which helps with class discussions as we feel more open to talk about real things. And within that family, obviously, is the staff. They work extra hard to get us what we need and take that extra step beyond the classroom to support us. What has been your best memory so far at Syracuse University? My favorite memories have been as a Freshmen Orientation Peer Advisor. Every year for orientation, we all dress up in our matching orange shirts and give our advisees tours around campus based on their class schedule. Ultimately, it’s a big support group, helping freshmen get all of the resources they need to succeed. Walking down the promenade on a windy Monday afternoon, the banner above Schine Student Center caught my eye. Schine almost always has a banner above the doorway, advertising a University Union event or bringing awareness to a campus campaign. This one held my attention, because it said, on a rainbow background “Queer and Trans Existence is Beautiful”. LGBT resources and community spaces were not something that I looked into while determining my college of choice, but I have found that Syracuse University has many. 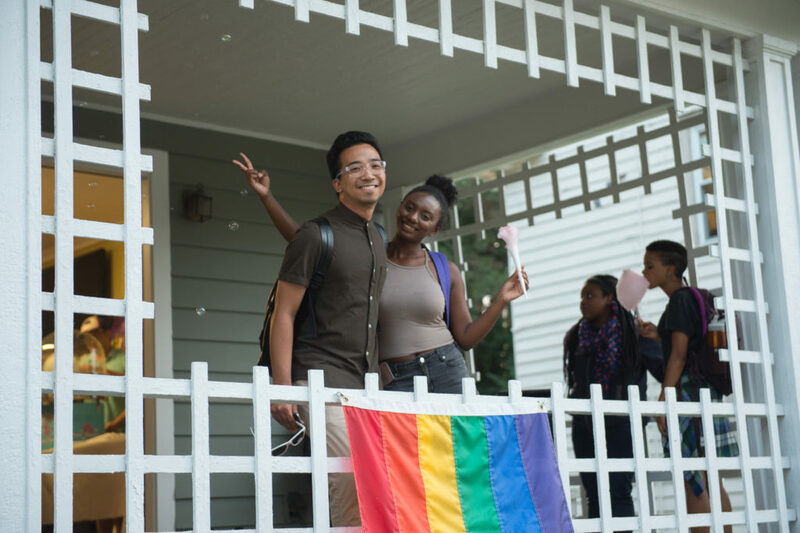 The first week of classes, I was able to attend an event put on by the LGBT Resource center, and solidified my first friendships here while sitting on the front lawn eating ice cream at their kick-off Ice Cream Social. I haven’t attended many of their discussion groups, because often they are comprised mostly of graduate students, but that first event I went to, where students spilled out the front door of the building and covered the lawn, was a powerful motivator to find more resources and forms of community on campus. Noah Mendez, a sophomore Forensic Science major, took some time to tell me about his experience with LGBT communities and resources on campus – specifically the LGBT learning community housed in Lawrinson hall. During his freshman year, he was able to meet people like himself, make connections, and feel a sense of community among the members. The friendships he made were lasting, and based on a shared identity. 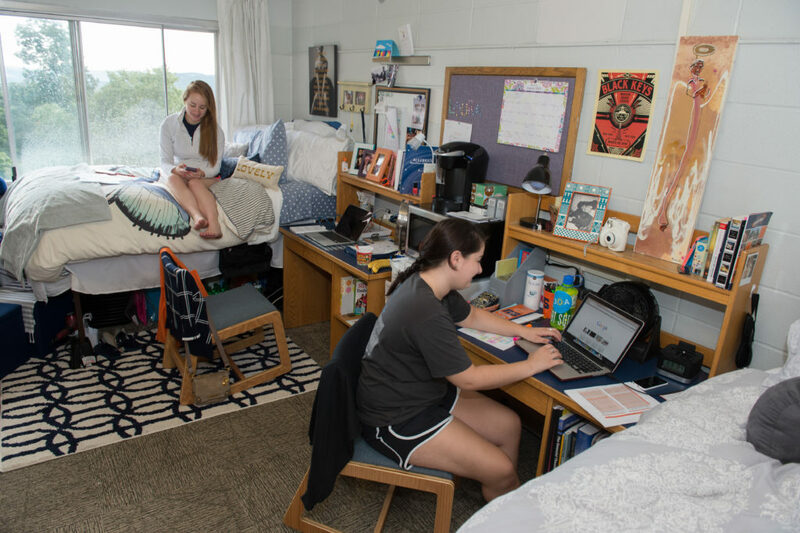 Other past and present members of the learning community comment that, as a freshman, having the learning community was a welcoming way to start their college careers. Pride Union is a registered student organization on campus for LGBT students. It meets on Friday nights in the Hall of Languages, and it’s a great source of community on campus. They also put on some pretty cool events throughout the year: a drag show, which two years ago had RuPaul’s Drag Race contestant Milk as a special guest. A less extravagant event that I’ve always enjoyed was the Pride Union clothing swap, where you can bring clothes that you no longer wear and pick up new clothes that other people have brought to pass. It’s great for sprucing up your wardrobe, and getting rid of clothes you don’t wear anymore – particularly if you’re looking to trade your old blouses for men’s button-ups or your jeans for skirts. Syracuse University has shown me a lot of different places of community and resources for LGBT students, a refreshing and unexpected change from high school GSAs. Meg Burnard ’20 is studying Communication Sciences and Disorders and Linguistics in the College of Arts and Sciences. She grew up in Rochester, New York. Meg is a member of Democracy Matters, and in her free time she enjoys reading comics, going to concerts, and playing games with friends. More blogs from Meg Burnard. Spring Break is the one week off during the school year where you probably don’t have any obligations. In the fall, there’s Thanksgiving, and in the winter, there’s Christmas, New Year’s, sometimes Chanukah depending on the calendar. That means family holiday parties, traditions, family time. Spring Break does not have any of that! The closest thing it has to a big, important holiday is Saint Patrick’s Day, and that is really more of an excuse to eat green food. Nothing gives you the warm fuzzies and keeps you busy like taking your free time and using it to help others! Friends of mine stayed local this past spring break to build tiny homes for homeless people in Syracuse. Syracuse is a city with one of the largest wealth gaps in the country, so even though the area around the University is clean and nice, coming down off the hill to help the community is a great way to give back! Yes, it’s boring, but going home and picking up shifts is a great way to fill up your schedule as well as your pockets! Plus, a few nights of babysitting and house-sitting is all it takes for me to feel like I’ve had a productive week off, even if I spent the rest of my time sitting around like a couch potato. If your spring break lines up with other friends from home, you may just want to go home and visit them, but it’s also a great time to go visit with college friends too! Bringing someone home for Spring Break made my spring break way more fun – I had an excuse to go to the hipster coffee joints and stores that I would not have ventured to otherwise, to show a newcomer the cool parts of my town and city. Plus, a buddy who will yell at the TV with me while we watch bad reality television. Traveling could be as simple as road-tripping to Toronto or Niagara Falls for an afternoon, or as wild as jetting down to somewhere much warmer, sunnier, and maybe even beachier than Syracuse. I know people who have gone to Europe, to the Dominican Republic, to Florida, and people who drove down to see friends at nearby schools. Spring break is a great time to explore the world! Or the state. Or the campus of someone else’s college. The world really is your oyster, and there’s so much that can be seen, done, and accomplished in one free week. So take it and run with it! Growing up with a mom who worked in communications, I was curious about her role in developing a company’s image and reputation. During my sophomore year in high school, I wanted to find a way to learn more about the field and get a taste for college life. Syracuse University Summer College for high school students offered both. 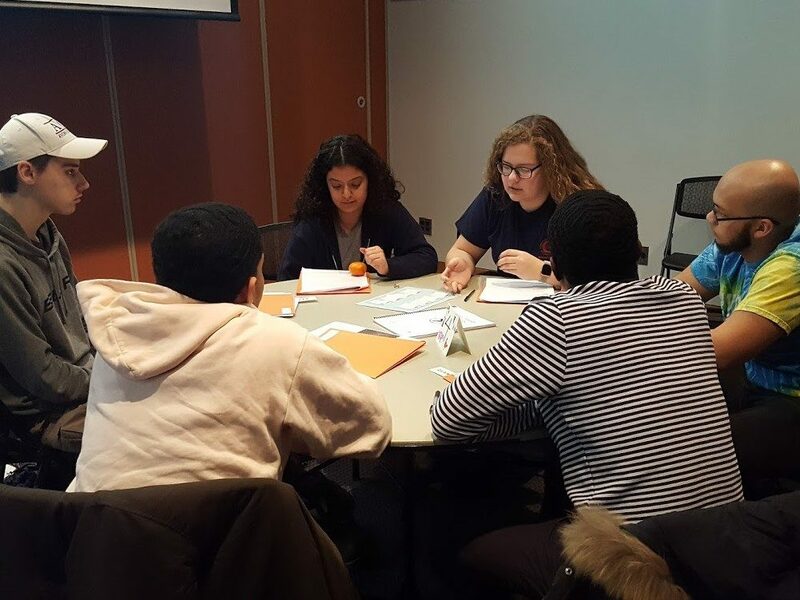 Summer College allows high school students to take courses in various programs over a 2-, 3-, 4- or 6-week time period while living in Syracuse University housing and experiencing college life. At first, it was exciting to live on my own, but I also had to take responsibility as there was no one to remind me to stay on top of my schoolwork. I had been away from home before, but never in an environment where I knew absolutely no one. At Syracuse, everyone was so nice! The classes I took at Summer College helped me earn college credits that I was able to apply to my undergrad studies. And best of all, it helped confirm my decision to major in public relations. As a junior in high school, I was excited to have a goal to work toward. I felt so confident because I was certain of my major. While Syracuse was one of my top choices, I kept an open mind and visited other colleges along the east coast. But none of them felt like home. After visiting Syracuse a second time in the fall – when I could see it during the academic year – I knew it was everything I ever wanted from a school. I chose to apply Early Decision to the S.I. Newhouse School of Public Communications, and never looked back. My Summer College experience didn’t keep me from feeling homesick my first semester, but overall, I felt more confident on campus and in the classroom having spent significant time here before enrolling. Now, after being here for a semester, I couldn’t see myself anywhere else. The community at Syracuse is so inspiring and diverse. The more Newhouse classes I take, the more certain I am that I made the right choice. Courses are challenging, but the topics are so interesting and my professors are extremely knowledgeable and supportive. I have found friends at Syracuse that I couldn’t imagine living without, and I proved to myself that I can succeed. My field of study is very broad, but I’m confident that with time, internships and more classes, I will find the specific track that’s right for me. 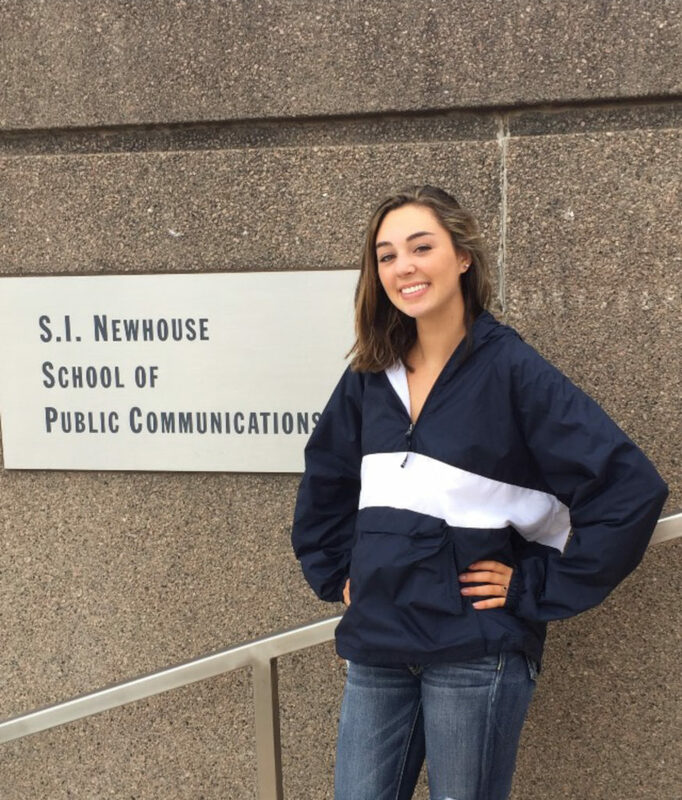 Regan Talley ’21 is studying Public Relations in The Newhouse School of Public Communications. She grew up in West Chester, Pennsylvania. Regan is a member of PRSSA and in her free time she enjoys baking, going to the gym, and getting coffee with friends. The summer before I came to Syracuse University, I heard piles upon piles of sage college wisdom. Aunts, uncles, teachers, older friends, each dispensed their nuggets of College Knowledge on my waiting ears. They expected me to be stressed – about classes, about leaving home, about making friends – and tried to assuage my fears with fun stories about their time at college. Whether it worked or not, I can’t say, but I tried to absorb it all as if I was studying for a final exam. Overwhelmingly, the advice wasn’t about classes, or dining halls, or getting lost on the first day (though to be fair, that stuff turned out to be pretty straightforward). Everyone wanted to tell me about their college roommates. Every story seemed pretty much the same: lasting friendships, sisterly bonds. An aunt told me that my roommate would be the first person to come through for me in a jam. My dad was in one of his college roommates’ weddings. It’s really cathartic to know going into a new, scary place where you don’t know anyone, that you’ve got a built-in friend on your very first day. Many of my peers and I were of the opinion that Facebook is mostly for moms, but everyone I knew was putting that aside to scour Groups and Pages for the perfect roommate – their perfect first friend. That seemed like a lot of work for me, so I put in a request for a random roommate and let fate guide me from there. It was only afterward that I started to fret about it. What if we didn’t like each other? What if we weren’t friends? Would my college experience be ruined? Fast-forwarding to my first few days after move-in, my new roommate and I quickly realized we had next to nothing in common. She was nice and smart, and she kept to her half of the room, and for my entire freshman year, that was about as far as our friendship went. We sat in companionable silence and did our homework on opposite sides of the room. I offered her pizza when I ordered too much, and she offered me some leftover fries. Beyond that, we kept to our own circles. At first, I felt a little gypped. I’d heard all these great roommate stories, where was my automatic BFF? But as the semester went on, I quickly found my own friends, in dining halls, in classes, on other floors of my dorm. People I did have things in common with, who I really jived with. Within a week, I had a veritable circle of new friends, who I’d only met because I wasn’t attached to my roommate all the time. One trip to the dining hall by myself, one “great T-shirt, dude, I love that show!” and I didn’t even need a built-in best friend. I’d found the people that would become my best friends all on their own. The one thing nobody told me on my journey toward Syracuse was that in the end, you don’t have to be best friends with your roommate. At this point, I think it was better for me that I wasn’t. I branched out, met more new and interesting people than I would have otherwise. Now, though, as a sophomore, I can tell you that having a roommate that’s also your best friend? Also a pretty sweet deal. The Writing Center is right in the quad. Inside you’ll find a group of writers, professors or masters students, who specialize in writing–all waiting and willing to help. To get started, there is a quick online sign up, but you only need to complete this once. After that you can go to the writing center whenever you want. Appointments are thirty minutes to an hour. I just started going to the writing center so I can vouch for its effectiveness. Although I consider myself a decent writer already, every time I go to the writer center I am impressed by the techniques and recommendations that really improve whatever I am working on. Syracuse also offers some great tutoring services from a variety of places. Business fraternities such as Beta Gamma Sigma, Alpha Chi Sigma, Beta Alpha Psi offer tutoring for specific courses and majors. Most colleges within the university also offer their own peer-tutoring services as well. Beyond that, there are even several clinics that provide services as well. Office hours are another great way to get a better handle on your coursework. Syracuse professors hold office hours every week. These blocks of time give you the chance to directly ask your professor about the work he or she assigned. Consistently attending office hours is also a great way for students to build real relationships with their professors, which can be extremely beneficial down the line when you start applying for jobs and internships. 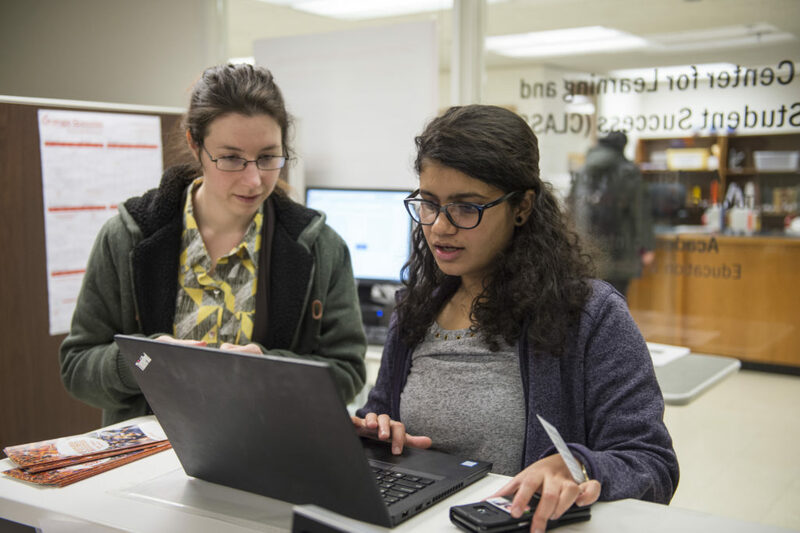 So as you consider the transition from high school work to a college course load, rest easy knowing that Syracuse has resources available to help you stay on the right track. Jalen Nash ’20 is studying pyschology in the College of Arts & Sciences. He was raised in Flatbush, New York and attended high school in New Jersey. In his free time, Jalen enjoys playing football and basketball, listening to music, reading, and writing. Jalen hopes to make a living, and be remembered, for his writing. More blogs from Jalen Nash. My roommate story continues this semester as my newest roommate, a transfer student who moved into the room my best friend vacated when she went abroad, packed up and dropped out last week. It was very sudden and unexpected, but there were external factors, and she was struggling to acclimate to such a large school. Sometimes it can’t be helped. It made me think, though, about what I like about going to a “large” university, with a little over twenty thousand students. I do like it, a lot, but I know that it’s not for everyone. I like the anonymity that comes with going to a school where you can’t possibly know even a third of the population. It means that you meet new people every day – your classes are full of new faces. As I get more specialized in my major and take fewer gen-eds, I’m finding that I see more and more familiar faces, but even in classes of thirty there are always people I haven’t met. I like walking down the promenade in my own little world, getting my coffee and heading to class among people who are also doing their own thing. Another thing that I like about going to such a big school is that it allows for a lot of diversity in extracurriculars. If I went to a school that had five thousand people in it, I probably wouldn’t have my pick of six different environmental clubs, each which focus on and do different things. I certainly couldn’t login to OrgSync, a portal for student organizations on campus, and find over three hundred different student organizations. Around 70 of them are just greek life, meaning that there are 70 different social, leadership, or professional fraternities or sororities at your fingertips. If, like me, greek life isn’t your jam, that leaves just about 250 other things for you to try. Want to try hosting a radio show? We’ve got that. Want to join a religious club focused on outreach in the community? There’s a bunch. Want to write for a student publication about politics? Music? lifestyle? Campus news? Jerk magazine, 20 Watts, Equal Time, and the Daily Orange are all waiting for your voice. With so many clubs and orgs, it’s so easy to make your Syracuse experience unique, and find people who like the same things you do. Even outside of clubs and organizations, with twenty thousand students – around fifteen thousand undergrads – there’s so much room to find other people like you. I can’t imagine that, if I’d gone to a small school, I’d have been able to pull together around ten other people willing to sit around and play Dungeons and Dragons with me. I’ve carved out my spot here at SU, and even though the University is big, I’ve never felt like I couldn’t find my people. Living on your own means learning how to budget, which is especially important in college. I’ll admit though- as a senior, I am still pretty bad at budgeting. I’ve lived away from home for three years, the last year off campus and renting a house, but I never took the time to look at my finances and make a solid plan for spending. I found myself living week to week spending way too much money and then not spending anything to make up for it. Luckily, Syracuse provides students with resources to help plan out budgets. And especially lucky for me, one of my closest friends, Taylor Pasquariello, is part of the team of student coaches qualified to help their peers create budgets and start investing in the future. Taylor and I met freshman year in MAX 123, (Critical Issues for the United States). We ended up joining the same sorority and now she’s one of my best friends. When I was stressing last week about my budget, she offered to walk me step-by-step through the the budget creation process. She wasn’t working, I wasn’t paying her anything, and she probably had her own work she could have been doing, but she ended up counseling me for over an hour on how I can have a fun senior year and not break the bank. Some of her best tips? Well, for me, I spend a lot of money buying food when I’m on campus instead of cooking at home, so just taking the time to go home to eat or bringing food on campus to snack on while I’m studying has already helped me save money. Taylor also encouraged me to make a savings account so I always have some money in case of emergencies or unexpected purchases. You don’t have to know a Smart Money coach to get free help– students can sign up for Smart Money appointments on Orange Success. It’s great that SU provides students with resources to plan financially for their futures. It’s never too early (or too late) to start saving!